This page provides a short history of The Church of the Assumption of Our Lady. A more detailed history can be found in the twenty-page booklet “The Church of the Assumption of Our Lady A guide to its HISTORY and TREASURES” by R H Rooke Freeman (pictured below), copies of which can be found in the church. 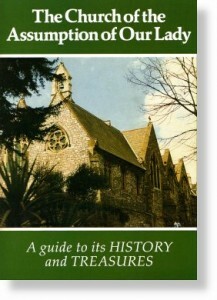 The Church of the Assumption of Our Lady was built on land donated by Robert Shedden Sulyarde Cary. The Right Reverend George Errington, first Bishop of Plymouth, laid and blessed the first stone on 24th April 1853, in a ceremony also attended by the Honourable and Very Reverend Canon Clifford and Canon Power. The church was consecrated by the Bishop less than a year later on 17th February 1854. 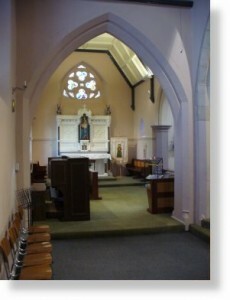 The Northern aisle was added with the Lady Chapel in the late 1850s when Canon Edward Windeyer was Parish Priest. 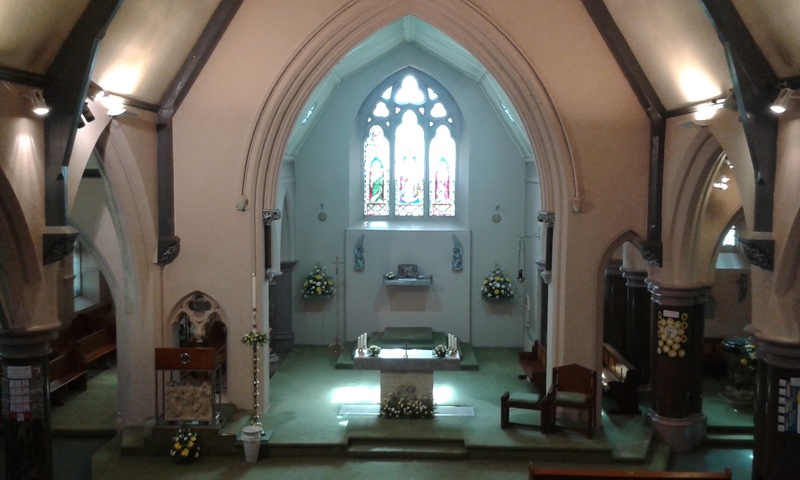 The Southern aisle and Chapel of the Sacred Heart were added fifty years later as a gift from Colonel Lucius Cary, and were consecrated by the Right Reverend Dr Graham, third Bishop of Plymouth. 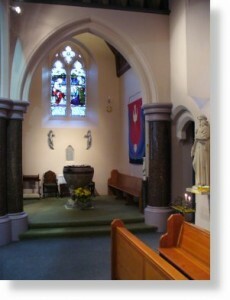 In 1981 renovation was carried out by Monsignor Anthony Gilby, Parish Priest since 1978, to equip the Church with facilities required to carry out the liturgy of Vatican II Council. As part of this work, a new altar (pictured above) consisting of approximately 750 kg of Cornish De Lank Granite was constructed on the mensa of the original altar. The Baptistry was formed at the East end of the Southern aisle, and the Holy Oils are stored in an aumbry in the East wall of the Baptistry where the Paschal Candle also stands. The Southern aisle (pictured above) features a window depicting the Lord telling Martha that “Mary has chosen the better path”. The Northern aisle (pictured below) features the Rose Window, depicting events relating to Our Lady’s part in the redemption, including St. Joachim praying in the wilderness, the marriage of St. Joachim and St. Anne, Our Lady as a child on the third step of the Holy Temple, and St. Joachim and St. Anne rejoicing in the Heavenly Jerusalem. Also present in the Northern aisle is a statue of Our Lady and the Holy Child, which was probably installed at the time the aisle was built by Canon Windeyer.